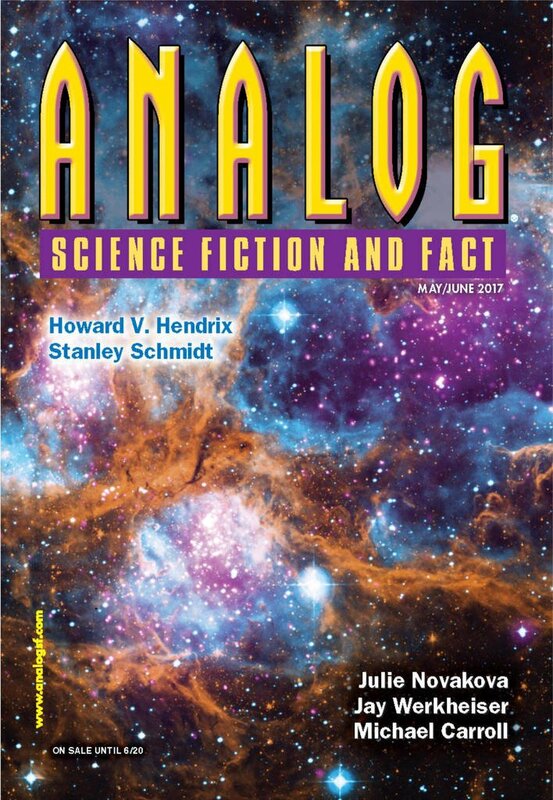 "To See the Elephant," by Julie Novakova [bio] (edited by Trevor Quachri), appeared in Analog Science Fiction and Fact issue 05-06|17, published on April 20, 2017 by Penny Publications. Pro: Who doesn’t love a story about elephants? The plot is clean and complete: Adina finds out what Mgeni’s problem is and even frustrates a poacher in the process. Con: The alternating point of view between Adina and Robert is a little confusing. Robert’s infatuation with Adina seems pointless. The resolution that Mgeni is a chimera works, but it comes out of the blue. Nothing prepares us for it. Some of the narration is too intrusive, and some of the dialogue is unnatural.